Livestock production plays a critical role in sustaining livelihoods and ensuring food and nutrition security for millions of families across Africa. The centrality of livestock in achieving sustainable development for cannot be overstated. It is also true that livestock production is the largest source of greenhouse gas (GHG) emissions from agriculture. In terms of global averages, the emission of methane as a result of enteric fermentation in ruminants (digestive processes that decompose and ferment food) produces about 40% of the total emissions from agriculture. In Africa, although total GHG emissions from livestock are still lower than in industrialized nations, the emissions intensities per unit of animal product produced are very high which is a cause for concern seeing that the sector is expected to continue to grow. Concerns over the environmental impact of livestock production through GHG emissions have intensified stakeholders’ efforts to design interventions that ensure that the sector makes sustainable contributions to food security and livelihoods. 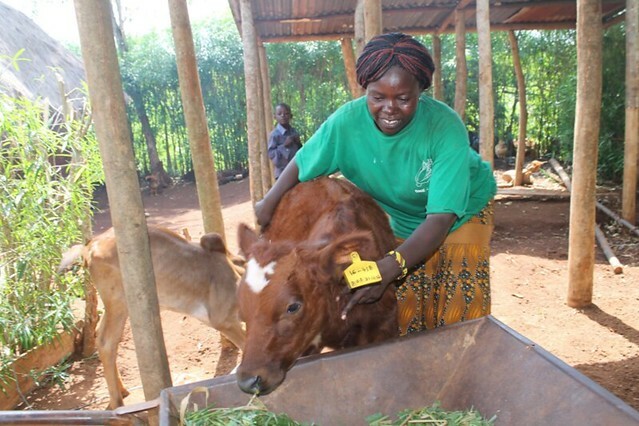 Auma is a dairy farmer in Busia County, Kenya (photo credit Raymond Jumah/FIPS-Africa). Improving the productivity of livestock could significantly reduce GHG emissions intensities from domestic animals in East Africa and address the challenges of meeting a growing demand for animal protein within the region. Both Kenya and Ethiopia have economically important livestock sectors. In Kenya, the livestock sector contributes about 12% to Gross Domestic Product (GDP) and 40% of agricultural GDP. In Ethiopia, livestock production contributes between 25 and 45% of agricultural GDP. Efforts by farmers, researchers, public and private sector investors and policymakers to improve the productivity of livestock production while at the same time minimizing any negative impact of livestock on the environment are bearing fruit. A recent study by International Livestock Research Institute (ILRI) researchers Polly Ericksen and Todd Crane examined the potential of nine low-emissions development (LED) options to reduce the emissions per unit of animal protein produced in East Africa. ‘The feasibility of low emissions development interventions for the East African livestock sector: Lessons from Kenya and Ethiopia’, considers LED interventions under three major categories—improving feed quality and availability, manure management, and animal husbandry. The options were assessed in terms of their suitability for specific farming systems, their technical potential, barriers to adoption and the potential incentives for farmers. Results showed that producing and using improved forage for animal feeds was most suited to intensive and semi-intensive dairy farms and mixed systems as such systems require collection and storage of fodder to feed animals on farms with limited grazing. This intervention could potentially reduce emission intensities by 8–24% in Kenya, and by up to 27% on mixed systems in Ethiopia. The researchers also found that the use of biodigesters in intensive dairy farms with four to five cows or more could cut total GHG emissions from manure by 60–80%. However, installation costs, the need to transport liquid slurry and the labour required have been identified as major barriers to adoption. The study also reports that manure storage and covering could reduce total methane emissions from manure by up to 90%. Lack of knowledge on the benefits of manure composting and spreading to soil fertility was recognized as a key barrier to uptake. For animal husbandry, reducing the chronic disease burden from intestinal parasites and ticks, slaughtering meat animals at a younger age and the use of artificial insemination to improve animal genetics were investigated. The study found that livestock productivity in both countries can be improved by reducing the chronic disease burden but farmers do not currently perceive real benefits from this approach. Evidence also suggested that reducing the age at which meat animals are slaughtered combined with improving feed quality, could help extensive pastoral systems reduce the emission intensity of cattle production by 40%, and 34% for sheep and goats. Increasing artificial insemination (AI) could also improve fertility and thus introduce improved breeds that replace less productive animals in intensive dairy farms. However, lack of quality services, and the perceived costs and risks involved were identified as barriers to farmer uptake of AI. The study recommends increasing production of improved forages in mixed systems and intensive dairy, the use of biodigestors in intensive dairy and improving the management of grazing for pastoral systems for reducing livestock GHG emissions intensities. These top three recommendations are based on factors such as geography, technical viability and feedback from farmers and national stakeholders. The study also assessed the gender dynamics of livestock production in the region. Findings showed that women, who are responsible for many livestock-related tasks in dairy systems face barriers to adopting improved practices and they rarely have control over decisions regarding the animals, the milk produced or the income derived from milk sales. Interventions should consider that women already have a heavy labour burden and are unlikely to adopt practices that will add to it. ‘These interventions could greatly improve the productivity of livestock systems and potentially the profitability for farmers and other value chain actors but will require additional investments to increase their social and economic feasibility,’ reveals the study. It is further noted that the basis for any interventions should be access to improved feeds and forages year round. Dairy farmers during a fodder development training in Western Kenya (photo credit: ILRI/Dorine Odongo). Following up on the low-emissions options study in Ethiopia and Kenya, a related cost–benefit analysis of fodder production as a low emissions development strategy for the Kenyan dairy sector was carried out. This study focused on analysing fodder because access to adequate and quality feed is a prerequisite for other livestock productivity improvements such as improved breeds. Though recognized as a viable approach for reducing GHG emission intensities, the production and use of improved feeds and forages is constrained by unavailability of land, limited (access to) capital and lack of forage seed of sufficient quality. Lack of sufficient commercial opportunities is also a major hindrance to the production and use of improved forages. 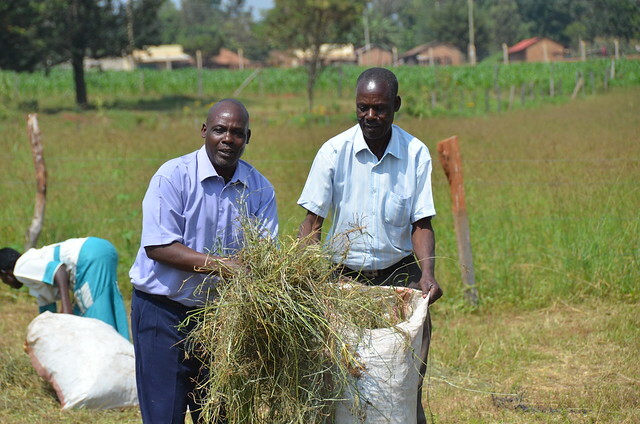 To demonstrate the potential of improved fodder species and tackle these barriers, investments need to be made in local field trials and extension activities. It has also been noted that fodder markets are only weakly developed and very few farmers have experience with commercial fodder production. To address this challenge, cooperatives and milk processors can provide support with extension as well as bulk purchase and sale of fodder. All these factors, provide a solid justification for an investment in a project specifically to improve fodder production. Presented as a business case, the cost-benefit analysis provides a clear assessment of the economics and profitability of fodder production within the dairy value chain in Kenya focusing on farmers, input suppliers and other value chain actors including cooperatives, processors, and traders. It clearly describes the costs, benefits and risks involved in implementation. Thus, it provides a clear articulation of both public and private investment requirements. Results from this study showed that enhancing smallholder farmer access to improved fodder could indeed increase productivity. It could also improve income and reduce emissions in key counties in Kenya where dairy production is prevalent. The business case model provides evidence that under every best-case scenario, farm profits would increase if farmers produced their own fodder. The emissions intensity reductions would also be significant (up to 30%). The government of Kenya has committed to including livestock in its Nationally Determined Contribution (efforts by each country to reduce national emissions and adapt to the impacts of climate change). The country’s Nationally Appropriate Mitigation Actions for the dairy sector (2017) includes increased commercial production of fodder combined with more access to extension services focused on productivity interventions as key target. All these developments demonstrate that the time is ripe to invest in the recommended LED interventions and specifically in the production of improved fodder. These studies were conducted as part of the CGIAR Research Program on Climate Change, Agriculture and Food Security (CCAFS), which is carried out with support from CGIAR Fund Donors and through bilateral funding agreements. For details please visit https://ccafs.cgiar.org/donors. The views expressed in this document cannot be taken to reflect the official opinions of these organizations. Read the report on the feasibility study of low emissions development and the cost-benefit analysis of fodder production in Kenya. Tags: CCAFS, GHG emissions, Mazingira Centre. Bookmark the permalink. Reblogged this on Mazingira Centre.